The bowl has rounded sides with a slightly outward turned lip, and a splayed foot. The sides are very slightly structured through five short vertical indents on the outside, faintly visible on the inside. 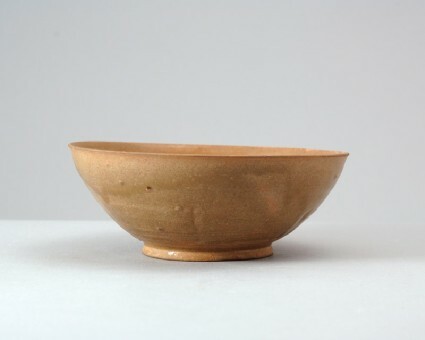 The grey stoneware is covered with an olive-green glaze which has turned reddish through burial in red earth. The footring was fully covered with glaze and the piece was fired standing on five dot-shaped spurs, which have left marks on the base.